‘Sauté Sessions’, an independently operated online television show, offers students relationship advice with a hearty meal. 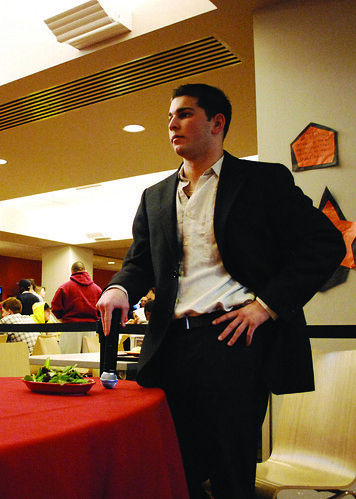 Anthony Turco, co-creator of Sauté Sessions, enjoys a meal at the Johnson & Hardwick cafeteria. The online TV show starts filming April 15 (Anna Zhilkova/TTN). The current age of technology has spawned a slew of independently created multimedia outlets, including MySpace, Facebook and YouTube, and senior Anthony Turco hopes to have the next big phenomenon with Sauté Sessions. Sauté Sessions is an independently operated online television show that will film its pilot episode April 15 in the Johnson & Hardwick cafeteria. While the title reveals it is indeed a cooking show, the program focuses on relationships and how we can all learn from each other and our past experiences. What started as an idea quickly manifested into a goal to try to reach out and help others, all while maintaining a carefree and relaxed environment. The show will air as an open-forum discussion. Turco and his staff have come up with more than 35 possible topics for discussion, ranging from funny and off-the-wall subjects to serious, intimate issues. The panel is also open to audience ideas. In fact, audience participation is not only encouraged but a crucial factor in whether the show will be a success. Of course, there cannot be a show titled Sauté Sessions without food. The show will have guest chefs from the J&H staff and possibly some Temple students in the future. They will be cooking up “good eats,” as Turco calls them, for both the panel and audience to enjoy. He also hopes to have guest musicians as part of the experience, as well. Turco anticipates the show to have different segments, including the culinary-themed “Breaking the Eggs,” “Off the Grill” and “The Hot Stove,” but the laid-back attitude of the show will allow for a multilateral direction, leaving plenty of room for improvisation. Sauté Sessions’ Web site, SauteSessions.com, will contain the edited episode by the end of the month. The Web site, as well as its Facebook page, also provide other avenues for viewer participation and communication. Turco, who also owns and runs his own DJ entertainment business, is self-funding both the show and the Web site. If the show and Web site take off, he is open to the idea of using advertisers but doesn’t anticipate accepting any monetary donations from supporters. “It would mean a lot more to me if people donated their time and energy and helped support the show by watching and participating,” Turco said. It’s difficult to predict Sauté Sessions’ long-term future, but there is potential for both a television show and an innovative social networking Web site. Regardless of what lies ahead, Turco looks forward to the journey. Nick DeLorenzo can be reached at nickdelorenzo@temple.edu.